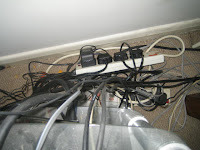 In our living room we have two areas with loads of cables and wires. One is around the TV and HiFi and at the other end of the room is the computer/home office. In the past I really didn't care too much. It looks a bit messy but it does the job. However, I'm now starting to think about child proofing the house for when the baby is born and starts crawling all over the place (I know it will be a while before the nipper is born never mind mobile but I'm planning ahead). It strikes me that a bunch of wires must be quite a tempting target for a kids little hands and they do so love chewing things. So I'm interested is any of you kind readers have had this dilemma and if so how you tidied everything up? Trunking? 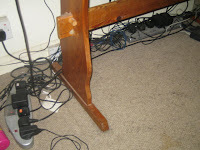 Cable Ties? New Equipment? Reduced Equipment? Cupboards? False Backs? What is the secret? For a second I was tempted not to list the equipment for incase it attracted unsavoury burglar types, but apart from the lava lamp I think these things are pretty standard these days. And yes I know the HiFi rack needs dusting. What couldn't get hidden in the cabinets got stuffed underneath them or down to the side (cables, etc. ), so there's not really much for little hands to play with. 'Course, #2 is growing at a rate and he now knows how to undo the child locks on everything. I know it's just going to be a matter of time before he tries to serve the DVD player with a drink of milk. Fortunately we got rid of the video (replaced it with a Humax PVR and also a Panasonic DVD recorder) so he can't post parcels and food into the flaps of the video player. I'd get a stair gate before I worried about cables! Hope all is well with aged father,enlarging mother and sprout.